In the above video, astronaut Doug Wheelock explains that traveling in orbit requires a speed of 5 miles per second. In my previous post, we determined that an object needs to travel at approximately 8 km/s, or kilometers per second. How do we convert kilometers to miles to make sure that our calculations agree with those of an astronaut? This is something that you can type into google to get the answer, but a teacher (or an exam) may require that you show your work. So let's get down! We can use these facts to convert our value of 8 km/s by multiplying by each of the ratios given above. Note that we must take care that corresponding units are written diagonally from each other. I color coded the units to emphasize that they must line up diagonally next to each other. This means that some conversion numbers will be in a numerator while others are in the denominator. For example, I need the km in the denominator of the second ratio to cancel out the km in the numerator in the first ratio. Finally, we need to use a defined value for the distance around the Earth, also known as the circumference. This value is defined as 24,901 miles. So our final ratio is listed below. We will apply the same math as earlier, making sure that the numerator and denominators which are diagonal to each other have the same units so that they can cancel out. According to our calculations, we can conclude that orbiting at 5 mi does cause you circle the planet approximately 16 times in one day. On my science blog, I shared my general thoughts on the wonderful movie Hidden Figures. On this post, I want to answer the one question I've received the most - how do you even get something into orbit around the Earth? And how do you leave orbit entirely? As with all of my posts, you can skip the diagrams if you want - the text should give you the general idea. Now on with the show! For our satellite to stay in a circle, both of these forces must be the same. This means that we can set the centripetal force equal to the gravitational force. Solving this equation gives us a velocity of approximately 8 kilometers per second, or 17,682 miles per hour. This is the speed that any satellite (including the International Space Station) has to achieve to be able to stay in orbit. It's also why satellite launches tend to curve right after leaving the launchpad - they need to get to the orbital speed and be parallel to the Earth's surface so they can be pulled into circular obit. My shirt has the answer! What if we wanted to find the speed needed to leave orbit entirely? This is what NASA did during our trips to the moon, and what NASA will do for our upcoming trips to Mars. 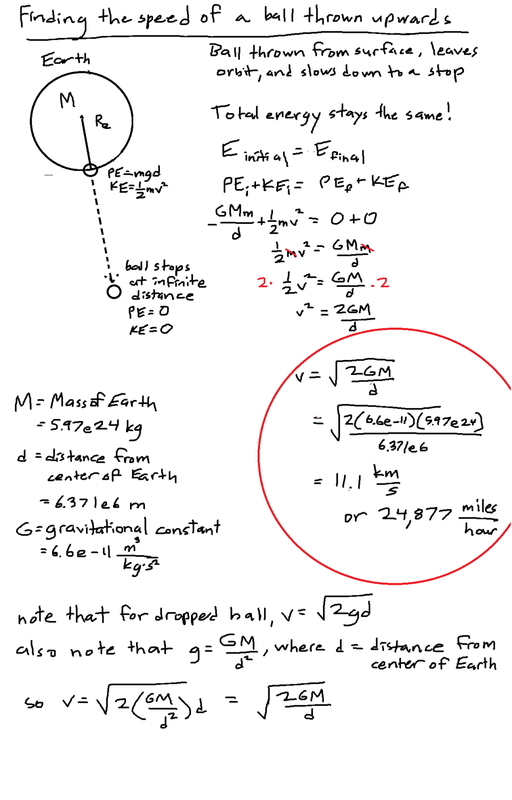 The calculation is more complicated than getting to orbit, but we can find the speed needed by using a a familiar example of dropping a ball on the ground. First, let's talk about energy. Total energy is expressed in two forms: kinetic energy (energy proportional to the speed of the ball) and potential energy (energy proportional to the distance above the surface). Before you drop a ball, it is motionless, so its kinetic energy is zero. Right before the ball impacts the ground, it is right next to the surface, so its potential energy is zero. The total energy throughout this entire trip must remain the same, so we can set the the potential energy before dropping the ball equal to the kinetic energy right before it hits the ground. Solving this equation gives us a final velocity equal to the square root of 2 * times the acceleration due to gravity * the original height the ball was dropped from. Note that just like with getting to orbit, the speed does not depend on the mass of the ball. The same energy situation applies if we throw a ball upwards, but our initial and final conditions are different. Now, we want to look at the energy of the ball just before it leaves the orbit of the Earth and compare it to the energy of the ball when it is an infinite distance off, when Earth's gravity diminishes to negligible value and the ball has zero energy. The reason we look at an infinite distance is because the force of gravity diminishes as you get farther from something, but never quite gets to zero. Just like in the case of the dropped ball, we can set the potential and kinetic energy at the beginning (when the ball leaves orbit) equal to the energy when the ball stops. We can then solve for the escape velocity, which comes out to be very similar to the speed of the dropped ball! Solving this equation gives us a velocity of 11.2 kilometers per second, or 25,000 miles per hour. Sometimes, you may have to solve a equation that has the variable in the denominator of a fraction! The best way to handle these problems is by using cross multiplication. This method can be used when two fractions are equal to each other. The key to cross multiplication is right in the name! Multiply the numbers that are diagonally across from each other, and set the products equal to each other. Please see the example below!